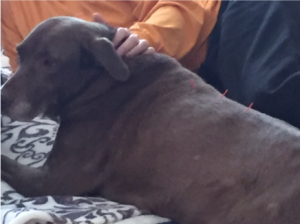 Our goal was to improve the mobility, comfort, and quality of life of a geriatric pet suffering from severe myofascial restriction through dry needling acupuncture and massage. The patient responded positively both on physical examination parameters and reported clinical signs at home. “Lady” is a 15-year-old Labrador Retriever who initially presented for a wellness exam. Lady’s current owners have had her for a about 1 year, and her previous medical and home history is unclear. It is thought that she and her younger companion Maxxi were kept outdoors most of the time and were provided minimal medical treatment. Lady has a history of heartworm disease for which she was recently treated with the three injection immiticide protocol. Lady is currently being treated for pulmonary hypertension with sildenafil. Lady had a suspected drug reaction to prednisone during her heartworm treatment, which resulted in elevated liver values (ALKP and ALT) but no apparent clinical signs. The liver values have decreased but did not return completely to normal with discontinuation of prednisone and addition of Denamarin. Lady also has a history of antibiotic-responsive diarrhea which is currently well controlled with daily tylosin. Lady does have an intermittent cough that is sometimes productive. The cough has been present since adoption and has improved minimally with heartworm treatment. Lady’s owners have noted that she is very skittish and is often startled by unexpected movements or noises. Lady loves to be petted on her head, but typically moves away when her owners try to pet her along her back. She is often restless at night and rarely sleeps through the night. Unlike her younger companion, Lady has shown an inability or unwillingness to get up onto the couch or into the car. Owners have also noticed that Lady is reluctant to take a normal sitting position and will choose to either stand or lay down. Lady has a good appetite, eats and drinks normally, and does not exhibit difficulty posturing to eat. On physical exam, Lady is bright and alert but nervous. Her vitals are normal. She does have an intermittent grade 1 left systolic murmur. She has moderate bilateral nuclear sclerosis and mild-moderate dental and periodontal disease. Her gait is symmetrical but short strided in both hindlimbs. Lady’s cervical range of motion is restricted with dorsoflexion; she will follow a treat laterally to both sides and ventrally with ease but is reluctant to look dorsally. She has taut bands in her hamstrings and biceps femoris bilaterally but more significantly on the left. Her tail posture is very low, even when she is wagging for a treat. Lady has marked fascial restriction along her spine, especially from around T10-L5. She has mild tenderness to palpation at her thoracolumbar junction with mild lordosis. She has a trigger point and ropy band along her right lateral thorax, near the 10th rib. She exhibits marked tenderness to palpation from L3-L5, and the hair in this area has failed to grow back fully from her heartworm treatment. Lady’s neurologic examination was normal; her cranial nerves appear intact, her spinal reflexes are normal, conscious proprioception is intact, and no crossed extensor present. Lady does have a few soft subcutaneous masses that are consistent with lipomas. My approach to Lady was, due to her temperament, very slow and gradual. I was aware at the outset that Lady does not like to be touched along her back, so the goal of my first several treatments was to introduce smaller diameter needles to relatively non-invasive areas with lots of positive reinforcement – pets from Mom and a jerky treat at the end – as I feared that introducing too much stimulation at once may mean the end of Lady’s acupuncture treatments. I would start with a few calming and non-invasive points, then progress to some bladder line points cranial and caudal to the areas that were most tender to palpation. I also wanted to incorporate some sacral points to see if we could address Lady’s tail posture and reluctance to sit. Although at this time I am still unsure if her reluctance to sit comes from sacral/spinal pain or hindlimb pain or both (or neither). Eventually my goal was to work on some more distal limb points, but would assess this as we went through treatment based on how Lady was responding and tolerating her treatments. Lady’s owners are very committed to and involved in her care, so I also encouraged them to work on some hamstring massages daily at home. My initial goal was to alleviate some of the myofascial restriction along her spine; she was so tense at the first visit that she was difficult to assess, but the more I worked with her the more comfortable she became, and the more responsive to palpation, and it became easier to pinpoint her areas of discomfort. Differentials for cervical and lumbar pain include nerve entrapment, muscular pain or myositis secondary to immiticide administration (lumbar), intervertebral disc disease or other myelopathy such as infectious or inflammatory or a vascular event, neoplasia of the soft tissues or spine, previous soft tissue or spinal injury, myofascial restriction, or referred pain from hepatobiliary or gastrointestinal disease. Lady initially came from a community where it is very common to keep dogs tethered on a leash outside, so her spinal discomfort may be from years of being chained up outside. Differentials for reluctance to sit and abnormal tail posture include sacral nerve entrapment or sacral spinal stenosis, myofascial restriction, previous trauma or fracture, congenital skeletal abnormality, muscular restriction in pelvic limbs causing discomfort. Infection, autoimmune, and toxicity are considered less likely due to chronicity of the lesions, and that the lesions are static. Lady’s bloodwork also does not reflect any evidence of an inflammatory response. I cannot rule out a congenital issue in Lady’s case as I am first seeing her as a geriatric pet; hip dysplasia and secondary osteoarthritis is one differential for her hindlimb gait and reluctance to sit. We do have thoracic radiographs of Lady which do not show any evidence of neoplasia, fracture, or spondylosis or her cervical or thoracic spine, nor did we see significant osteoarthritic changes in the visible skeletal structures (shoulders, elbows, spine). We do not have imaging of Lady’s lumbar spine or sacrum. I cannot rule out a disc herniation or other myelopathy but given Lady’s relatively unremarkable neurologic exam, a spinal cord lesion is less likely. My tentative assessment is that Lady’s discomfort is primarily myofascial, possibly with concurrent osteoarthritis in the pelvic limbs, and may be exacerbated by heartworm treatment and metabolic disease (hepatopathy). We began with weekly treatments, periodically every 10-14 days depending on owner’s schedule and how Lady was doing clinically at home. All needles were seirin J-type needles, and all treatment was dry needling (no e stim) or massage. I consistently used GV20 and GV14 with a 0.16x30mm at the beginning of treatments to help address Lady’s anxiety and hoping that GV14 would also help to address her apparent cervical pain. I was sometimes able to add a 0.16x30mm bilaterally at BL10 as well, but Lady has a tendency to roll onto her side so they didn’t usually stay in very long. I would also incorporate Bai Hui early in treatment to help with lumbar and sacral discomfort, and this is a fairly non-invasive area which Lady consistently tolerated well. Lady also tolerated BL27, BL28, and BL35 very well. In the first 2 treatments I used 0.16x30mm needles, but after the initial treatments we increased to 0.20x30mm needles. I addressed several points along the bladder line with 0.16x30mm needles. I consistently used BL 18 and 19 as the back shu points for the liver and gall bladder, BL21 for digestive issues as well as local myofascial discomfort, BL22, BL23, and points above and below any trigger points that I could identify. I would occasionally needle BL25 depending on how Lady was tolerating the treatments; however, BL25 was a significant trigger point for Lady. 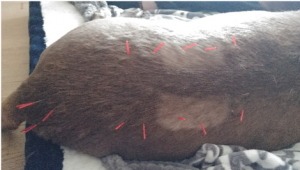 There were times where Lady was more reactive to palpation and we did not needle BL25 but chose to massage this area during and after acupuncture treatment. After the first few treatments, I began to incorporate points on the hip triad: BL54, GB29, GB30 with 0.16x30mm needles. We then worked toward stifle points: ST34, ST36, and occasionally SP 10, initially with 0.12x15mm needles as I was not sure how Lady would react. When I learned that Lady actually did quite well with dry needling around the stifle, we increased to 0.16x30mm needles and some manual stimulation of the needles. I addressed her trigger point along her thorax with dry needling, usually a few 0.12x15mm around the area as it was very tender and superficial, and massage. After about the third treatment, Lady’s owners began reporting that she is consistently sleeping through the night. There is evidence in support of acupuncture as a treatment for insomnia, but I suspect that Lady’s progression to sleeping through the night is more a reflection of decreased pain and improved comfort than direct effects on her sleep cycle. Lady’s tail posture has improved significantly and she holds her tail straight out or slightly up now. She is still reluctant to sit in general; however it was very rewarding to see her sit for her treat at the end of one of our appointments! Although Lady has not gotten up on the couch yet, she did put her front feet up on the couch for the first time. Her owners report that she is “prancing” and running around the yard with her brother Maxxi. On her physical exam, Lady no longer shows marked tenderness to palpation along her spine. She does still have some myofascial restriction but this is greatly improved. Lady will not only allow us to pet her along her back but has also allowed me to incorporate some massage into my treatments. Lady does still exhibit an intermittent cough and this is something that we hope to address more in our future treatments. Cao, H., Pan, X., Li, H., Liu, J. Acupuncture for treatment of insomnia: a systematic review of randomized controlled trials. J Altern Complement Med. 2009;15:1171–1186. Schneider A, Streitberger K, Joos S. Acupuncture treatment in gastrointestinal diseases: A systematic review. World Journal of Gastroenterology : WJG. 2007;13(25):3417-3424. doi:10.3748/wjg.v13.i25.3417. Diehl DL. Acupuncture for gastrointestinal and hepatobiliary disorders. The Journal of Alternative and Complementary Medicine. 1999;5:27–45. doi: 10.1089/acm.1999.5.27.